You have heard the saying too much of anything is a bad thing. This definitely does not exclude your personal finances. Surprised? 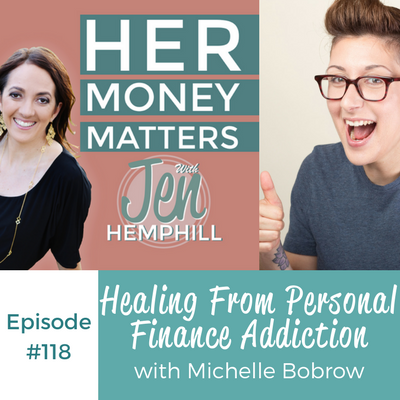 In this episode, we talk to Michelle Bobrow and she shares her enlightening experience with personal finance addiction (yes there is such a thing). One question to ask yourself when you find yourself going too extreme. Michelle Bobrow grew up in Queens, NY and she described her lifestyle as middle class — she always had what she needed. Growing up, they didn’t talk about money, but she could tell there was stress about money. She didn’t start paying attention to money until high school because of social activities such as prom and eating out. The first time she learned about debt was when she was in college and was figuring out how student loans worked. Michelle took the advice from her mom and decided not to worry about them until after graduation, but received a shock once the payments started to roll in—they weren’t as low as she was expecting them to be. After getting in this bind, she pushed herself harder and hard to be better at budgeting her finances. Levels of stress. Michelle said she had a really good handle on her finances, but she would still anxiously think about her money. When Michelle had a relapse with her cancer, she then realized her systems weren’t in her control, and it wasn’t working in her favor because of the amount of stress she was feeling. She needed to make more of an effort to live presently and more intentionally. After this realization, Michelle committed to leaving her job once she had a year worth of money in savings and paid off her student loans. At this time, The Holistic Wallet was already up and running for a few months. Michelle invested in things that had a non-quantifiable return on investment—she changed her budget to include more of the fun stuff. Schedule a time on your calendar to look at your finances and only do it then; have a boundary.